I like Kage Baker's Company books (Mendoza, before she's reduced to a simpering, love-sick nonentity, is one of my favorite characters in any series) and I love C.J. Cherryh's Union-Alliance future history (Signy Mallory of ECS Norway ranks as one of the most brilliant characters in SF (IMO) and Downbelow Station is a masterpiece). But I can't stand their forays into fantasy. I couldn't finish The Anvil of the World and Cherryh's fantasy tends to bore me. 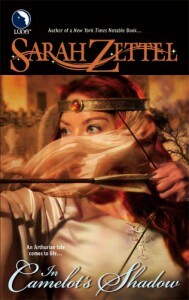 Sarah Zettel joins that band of authors whose SF I like but whose fantasy leaves me cold. I first met Zettel in her SF author guise - Fool's War, Kingdom of Cages, etc. - and enjoyed her writing. (Though, being reasonably honest, I confess to not remembering anything about the stories; all I remember is that I liked them.) And perhaps I should have known better: I hated A Sorcerer's Treason. But this was a tale of King Arthur, and because I didn't like one book didn't mean that I wouldn't like this one. But that turned out not to be the case. I gave Zettel 117 pages to convince me to go on but her arguments weren't good enough. The writing felt awkward and forced; there was never a point where I could lose myself in the story. I was always aware that I was lounging in a chair reading a book. Even in Mary Stewart's Arthurian saga, which I recently finished rereading and had issues with, I was engaged enough in the story and the characters to want to continue reading. Every few sentences, In Camelot's Shadow's clumsy prose jarred me back into reality. If I had time or inclination, it might be interesting to reread Zettel's SF novels to figure out why she fails for me in a fantasy setting. But in this case, I can't recommend the book. I can see where others might find interest in it, however, and wouldn't want to discourage anyone from trying it.